You are looking for something your child will like. Good toys should have longevity and contribute to a child’s development both physically and mentally. They should be well made, with a quality design; pleasing shapes, colours, textures, and sounds. Be both fun and safe. Pay attention to age recommendations. I have found simpler is often better. Before children have the words to ask for what they want, how do you pick what toys to buy? We tend to choose items recommended by other parents, that have positive online reviews, are a decent price and from a reputable brand. This doesn’t always mean the biggest and most well known as some of Norah’s favourite are from smaller companies and retailers. So, at 8 months old what type of toys do we have for Norah play with? A lifetime member of the less is more camp we have a few smaller toys such as; wooden blocks, stacking cups, rattles circa 1985 that were my partners, a couple of tactile books, a shape sorter, puzzles and soft musical toys. Babies under one don’t yet need too many electronic toys. We have a Jumperoo instead of a door bouncer. Tip: Rotate the toys. Play with a couple one week and then switch and introduce others the next to avoid toy overload and overstimulation. Norah is a lazy bunny and we are constantly encouraging her to sit and have independent time off mummy lap. To encourage this I was considering buying a large play blanket for our uncarpeted floors but instead was introduced to the Grow-With-Me Playtime Teepee. Infantino is a brand popular over the pond and available from recommended retailers in the UK like Mothercare and Argos. 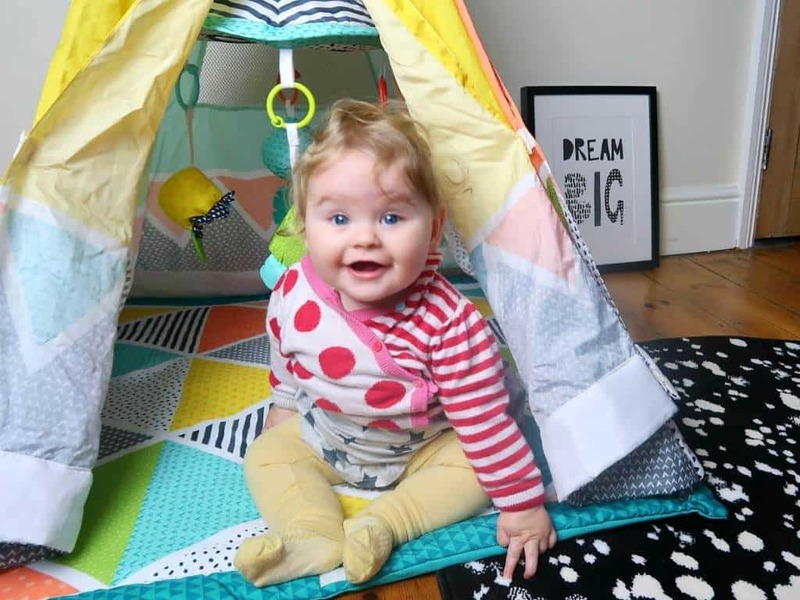 The Playtime Teepee’s stylish, colourful and gender-neutral brand-new design offers me reassurance in Infantino as a passionate and smart producer of child focused products. I prefer to purchase toys that have been improved and developed to offer the best experiences at playtime. Lay & Play, Sit & Explore, Crawl Tunnel & Playtime Teepee. Baby products and toys that have more than one use are always top buys in our house as a babies grow so quickly and have the attention spans of sandwiches. You could end up buying 1000 different items but instead we prefer to buy tried and tested toys that are versatile and adaptable. This means more space in the nursery and more money in the bank. Additionally, Teepees are a popular and enduring trend for playrooms and children’s bedrooms providing little ones with hours of exploration and interactive play throughout the early years. If you are looking at buying a Teepee you can expect to pay between £30 or £200 for a high-end version. Suitable from newborn to 3 years, this multi-functional play area the Grow-With-Me incorporates both a Wigwam and a playgym (with Leo I spent £69 and it got 2 months of use). The age by age guide to play- from tiny baby to toddler. Focus on sound and sight stimulation. Newborns respond best to bold, high contrast colours such as black and white that will captivate and hold baby’s attention. I love the modern geometric design style. A large-mirrored mobile; like the one on the Grow-With-Me encourages newborns and infants to engage in overhead discovery and lay n’ play fun perfect for hand eye coordination. The hanging piece can be hiked up by adjusting the length of the cord it hangs by and removed when baby is bigger. Focus on a baby learning to grasp and hold. Each plush toy In the Grow-With-Me Teepee has been given sensory consideration. To engage your baby one toy plays music, another is very tactile, another is a teether and the last has rings for little fingers to grab. A feature I recommend is the secure catch fixing the toys. There are many benefits of tummy time and luckily the Teepee fabric is easily wipeable. Its unique design mean practically, I or my son can also lie under it with the baby. Focus on sitting. The Teepee is robust but lightweight to lift from room to room. This is also a positive feature as little hands can easily grasp the sides to pull themselves up. If the Grow-With-Me tips it doesn’t cause any bumps or danger to little ones. As our floor is boarded I put a rug under the base for additional padding but would not want it to be thicker as even though the Infantino Teepee does not have a fold mechanism the soft base means its easily foldable and can lay under a cot easily. Focus on developing gross motor skills. We suggest gentle chase games. Crawl and explore with your baby. The sides open out so young children are not frightened by being in an enclosed space and to create a tunnel for moving play. The Velcro fasteners are a tad small so you need to place the flaps properly so they secure. The assembled size is 34 in x 34 in x 44 in so tall 2/3 year olds they may have to crouch but a larger product would take up too much space so I think the Teepee is the perfect cozy den. As its essentially two products in one the price tag of £69.99 (currently on sale for £49.99 in Argos) is a very reasonable one that we would recommend! Norah is currently happily babbling/dribbling all over her new elephant friend now while I have five minutes hot cup of tea! Does anyone else want a Teepee for their little ones? Or themselves?! Note: We were kindly gifted this item in return for our honest review. Moving House? Is It Better To Buy A New-Build Or An Older Property?